Very nice Mike and well worth the wait! You posted this last night, you must be home from work by now so where are the pictures. Very sweet looking lid Mike. Look forward to seeing more pictures. 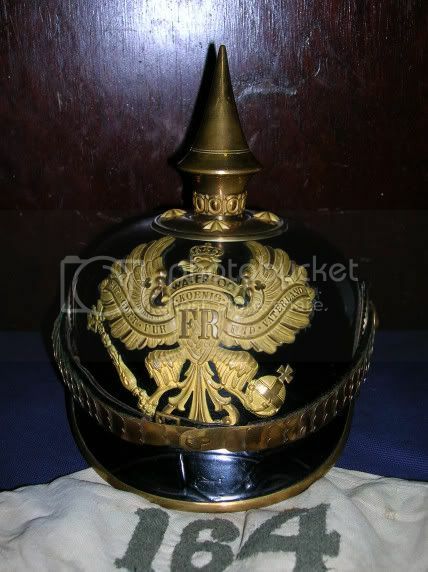 The lid is, as far as I can tell, all genuine, a little scared in places but that adds to it's appeal in my opinion. 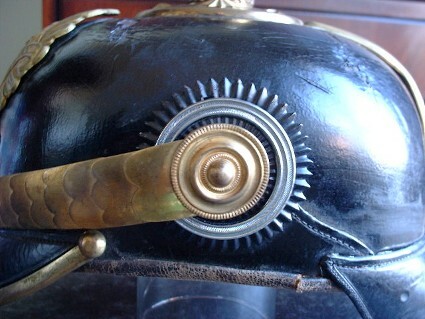 Well Gent's at last I've taken a few more pictures of my "Haube"
Here's a closer look at the chinscale strap ... flat scales as befits foot regiments. 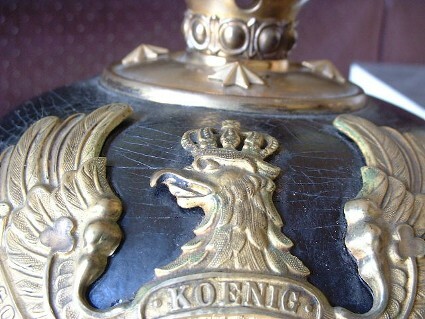 A very nice fire gilded Prussian "Wappen"
A shot of the left hand side with the correct and original officers state "Kokarde". Right hand side with the "Reichs Kokarde"
Officers Perlring ... and star attachments for the base plate. 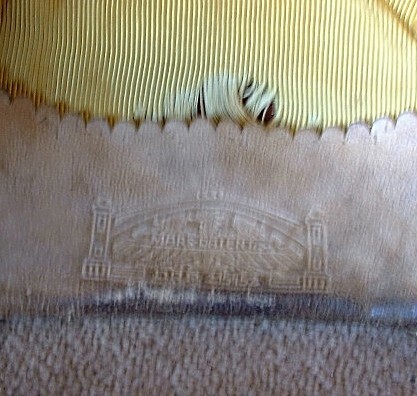 The private makers stamp on the sweatband, sorry about the fuzzy shot. Last one. 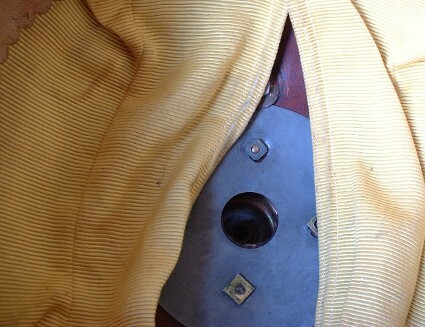 This is the inside ... showing attachment nuts for the baseplate and the silk linning. I'm not sure if these nuts ever had washers beneth them. They don't look as if they have ever been removed though. Is it usual to have different square nuts holding the stars in place or is it the lighting making one of them look silver coloured? Is the base plate painted? If not is it non-magnetic? 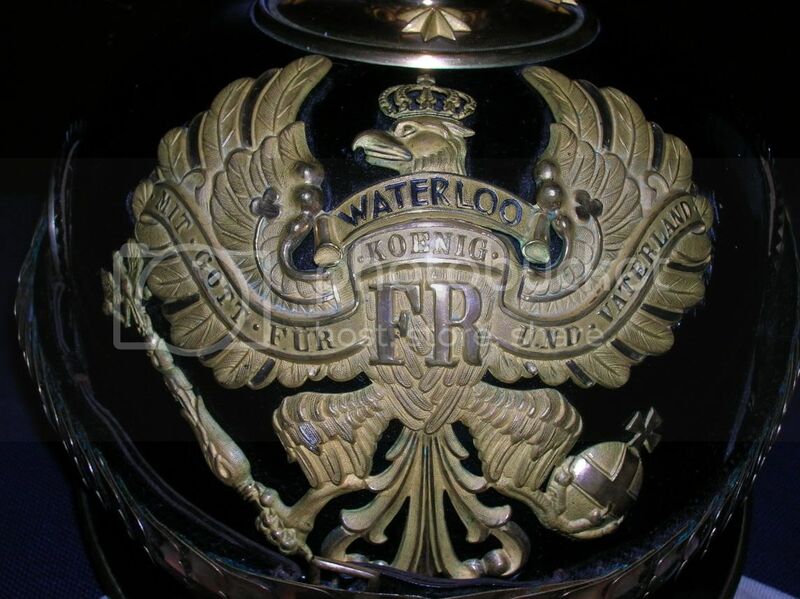 I've never seen a painted plate on officer's pickelhauben, only on ORs. Tony, I'm not so sure about the one nut, it is a greyish colour and I think this could have been replaced. The base plate is not painted and is non-magnetic. I'm not sure what it's made from? There are only the two holes for the front plate that also have nuts and washers holding it in place. I know diddly about helmets, but this sure looks pretty spanktacular! Great stuff lads. Are they cool or what? Why did I get rid of mine? This one's now on it's way to me ...better pictures will follow. 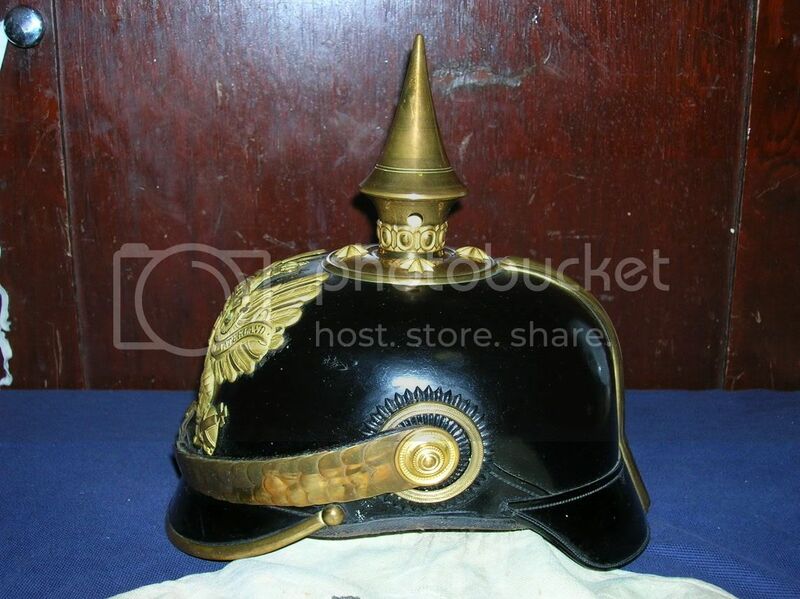 I believe it has replacement chin scales but the rest of the haube is original. 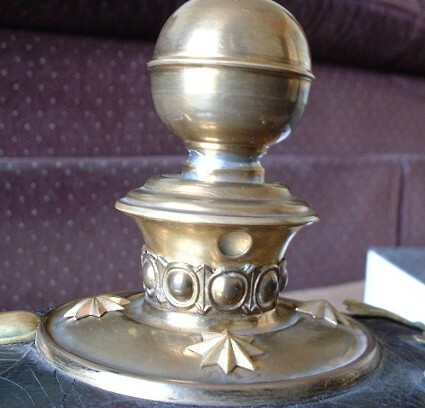 The picture I'm showing here looks like the fittings are in brass/gold ..but in fact all fittings are in silver. Please let me know your feelings about this one. Lets see. Cruciform spike base, convex chinscales, all silver. 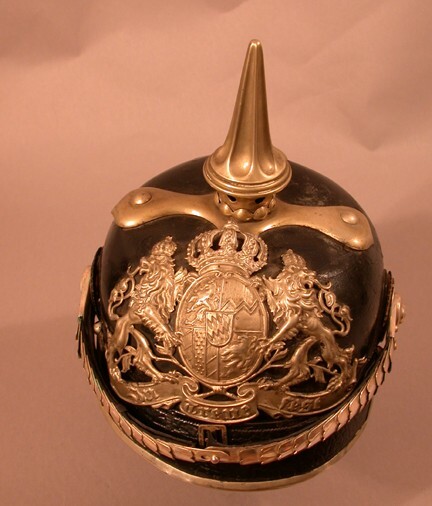 I would say that is is for a Bavarian Chevauxleger senior NCO. The scales look good to me, this type with rivets showing would not be used by an officer, but on an NCO, OK. The perlring and the lack of star studs shows it is NCO. I do not know what regt. yet. Still a nice piece and the first one you displayed is super. You do not find them unpolished and in that condition very often. 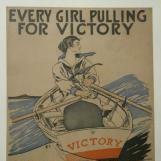 Keep this up and I will have to pull out my Id'd minty 164th with the Waterloo bandeau. Thanks Daniel for your comments. 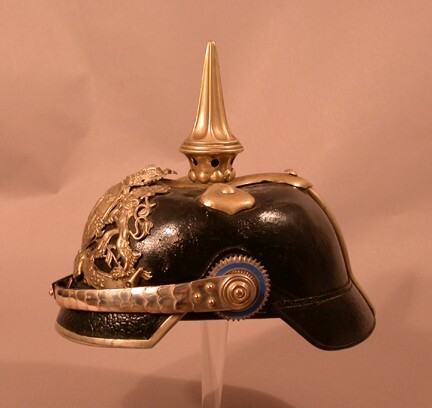 I beleive the helmet to be for an NCO/OYV in 1st Bavarian Schwere Reiter Regiment, 1897 model with the large Wappen. In fact it's arrived this morning so I'll get busy taking some closer shots. Very nice wappen! The chin scales look questionable, but as Dave said M15 type. This should be cool to take apart. I have a Bavarian that has a far later wappen. Not nearly as cool as yours, but it does not have M 91 posts but does have a bayonet spike. On the other hand, I have a Prussian pioneer that has the posts, but not the bayonet spike. Here you go, this was the best I could do at night inside with bad lighting. 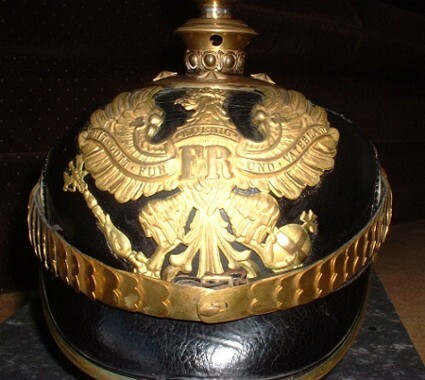 This was with a uniform grouping I got that belonged to Hauptmann d. R. Arnold Wilhelm Friedrich Ferdinand Heeren 1876-1974. The grouping was acquired from the immediate family by a fine gentleman and friend of the Heeren family after the Mr. Heeren passed in 1974. He went to college with the grandson of Mr. Heeren and met him numerous times. 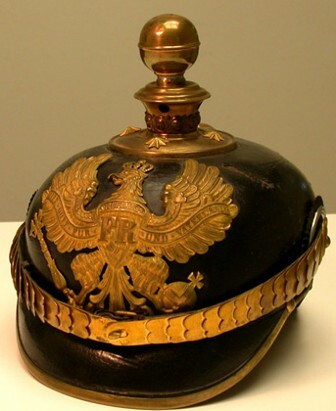 I have his entire family history, his geneaology back to 1580, and his military records from the Bundesarchiv. Professor Heeren was thrice wounded in WW1, On August 16, 1914 during the battle for the Fortress City of Namur, Professor Heeren was wounded by a shell splinter, which tore away part of the left side of his nose. On Sept. 10, 1915 Professor Heeren was again wounded in the face and ears by shell splinters.He returned to the front on May 12, 1916 and was then wounded in the left forearm by a rifle bullet on June 27, 1916. In October 1916 he was sent to command the II Battalion of Infantry Replacement Troops at Warsaw and served out the rest of the war in that capacity. In 1934 he joined the Luftschutz as a Hauptmann z.V. and in 1940 was transferred to the Luftwaffe in command of a Luftwaffe Construction Battalion. He retired in 1943 as a Major d. R.. 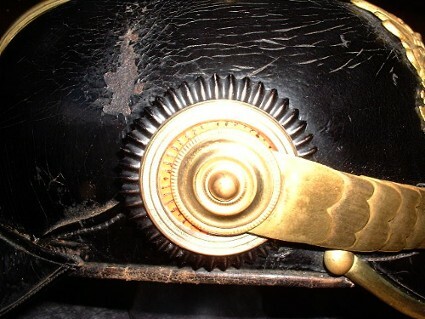 Here is another view of the helm.